“To catechize or not to catechize” is definitely not the question. Catechize we must. It is a mandate: “Go, therefore, and make disciples of allnations, baptizing them in the name of the Father, and of the Son, and of the Holy Spirit, teaching them to observe all that I have commanded you” (Mt 28:19-20). This missionary mandate requires great skill, will power, and constant docility to the Holy Spirit’s promptings, as well as flexibility with the changing realities we face through human history and the Christian presence therein. This Great Commission must also be characterized and driven by the Great Commandment: “You shall love the Lord your God… and your neighbor as yourself” (cf. Lk 10:28; Mt 22:38; Mk 12:30). How are we to fulfill the Great Commission here at home, when fewer of us go to all nations as missionaries, but all nations seem to be coming to us—even as “missionaries”? How are we to fulfill the Great Commandment towards all when our neighbors include a large and growing number of foreigners? First, we must will it. We must truly desire their good, as Jesus does. When the leper addressed him in his need, Jesus showed his willingness: “I do will it. Be made clean” (cf. Mt 8:1-3). We must will the good of newcomers as much as we will our own. Who are the New Hispanic-Americans? Latin American immigrants come to the U.S. from twenty-one nations (though some list twenty-seven Spanish-speaking territories on three continents.) Most enter from Central America and Mexico by foot or car; many fly in. They migrate for economic and political, professional and family reasons, usually in search of a better life in a more stable nation. Some enter the country with proper documents, others without; some overstay their visas. Some come and go; others come to stay. Some fear for their lives; many simply cannot in good conscience return “home” and leave behind their American-born children and/or spouse. Most see their work and contributions as meaningful and do not wish to give up a good thing; others know their quality of life would be greatly diminished if they left. Most prove in their new homeland that their hard work and entrepreneurial spirit has a fair chance of flourishing and producing lasting fruit. The vast majority of immigrants want a chance to enjoy a share of human dignity and the “American Dream”: to live and love; to be safe and secure; to put to use their God-given talents in a dignified and constructive manner; to earn a decent living; to bond and build a just society and a better world. They bring various needs, but they do not come empty-handed, looking for hand-outs: they bring a variety of talents and skills. Most are hardworking and decent. Many are skilled and entrepreneurial. Some are highly educated and accomplished. The majority of Latino immigrants are Catholic and many of them have been active in their parishes, lay ecclesial movements, and dioceses coming with a hunger for God and the ability to spiritually feed others. Immigrants bring gifts and are a blessing to the host country. The pastoral care of Hispanic Catholics is a crucial duty that we cannot ignore, especially given the high numbers related to migration and birth. In over forty U.S. dioceses, they already surpass the number of non-Hispanic Catholics. [ii] As American Catholics—or rather, Catholics who are American—we must give a thoroughly Catholic Christian response to the presence of migrants to the U.S., especially Latinos. A reminder from Matthew 25 and from the Catechism of the Catholic Church might help us bear in mind how serious our responsibility is toward our neighbor: “The catechetical tradition also recalls that there are ‘sins that cry to heaven’: the blood of Abel, the sin of the Sodomites, the cry of the people oppressed in Egypt, the cry of the foreigner, the widow, and the orphan, injustice to the wage earner” (par. 1867). …migration is in integral part of the Church’s life, clearly expresses its universality, promotes communion within it, and influences its growth. Migration thus offers the Church a historic opportunity to prove its four characteristic marks: the Church is one… holy… catholic... apostolic…. Faced with the vast movement of people, with the phenomenon of human mobility, considered by some as the new “credo” of contemporary man, faith reminds us how we are all pilgrims on our way towards our true homeland. “Christian life is essentially…a journey, a sublime migration towards total communion of the Kingdom of God” (CMU 10). Recognize that Hispanics are not a single, homogeneous group. They are U.S.-born citizens and foreign-born, recent arrivals, and fully-integrated, long-time residents. Some are fluent in Spanish and English; others are fluent in only one language. Some are highly educated and many are devout; others are not. Some prefer Spanish for worship and formation; others prefer English for themselves or their bilingual children and grandchildren. Develop a deep understanding of and appreciation for the countries and cultures represented, including the similarities and differences between immigrants from various countries and between them and Hispanic-Americans. Recognize areas of probable synergy and possible tension, and build into pastoral initiatives a copious amount of listening-oriented dialogue and respectful problem-solving. Identify the leaders. Meet the men and women of all ages whom the community respects, follows and consults, including ordained and lay evangelists, catechists, and pastoral agents of all sorts. Get to know and love them. Consult and survey these pastoral agents, especially those who came with valuable experience from their dioceses and have honed their evangelization skills while acquiring additional abilities in this, their new homeland. Consult them: inquire about the community’s needs and wants, hopes and dreams, problems and proposed solutions, resources and lack thereof. Nurture relationships within the community. Invest quality time, talent, and treasure in the development of their leadership skills, providing for their ongoing human and faith formation, and helping them acquire new skill sets and a broader understanding of the mainstream culture to fully participate in it and successfully contribute to it. Partner with the community’s leaders as equals and full participants in all planning and decision-making processes, from the initial identification of needs, brainstorming, and formulation of ideas and all the way through the development of a concrete plan, the evaluation, and the fine-tuning of each pastoral initiative, to ensure the effectiveness of ongoing pastoral care of Hispanics and Hispanic Americans and their full participation in the life of the local Church. Trust them. Enlist their continuous support and ensure they lead the actual execution of pastoral initiatives. Trust their commitment to Christ and the Church, their knowledge of themselves and of the Church's mission, their creativity and evangelistic zeal, and their ability to relate and communicate well among themselves and with other cultures and peoples despite any linguistic limitations and differences in communication styles. Show that "this (too) is the people who longs to see your face, oh Lord" (Ps 24), and that God's face is not white and blue-eyed, surrounded by straight blonde hair: the face of God is also olive and brown, surrounded by dark wavy hair to match his dark penetrating eyes full of love for humanity. Parishes and dioceses must show to and through the Latino community and its leadership “the many faces of God” and reveal “the face of mercy” for all peoples. Find or develop adequate pastoral resources for use among and by Hispanics. Good books, CDs and DVD series for education and spiritual growth can be hard to find, but existing resources can be professionally translated and inculturated. The greater the demand for sound doctrinal and pastoral resources, the more inclined Catholic organizations will be to invest in researching and strategically producing and distributing these much-needed resources for children, youth, and adults in the fastest-growing community in the Church today. Love your Hispanic brothers and sisters—and welcome all who migrate without evil intents and purposes—despite their customs, immigration status, language limitations, and the challenges they pose to our comfort zones. Love them deeply, sincerely, personally, and then love them some more! Do not fall prey to the temptation of our fallen human nature to see them as a burden. Say rather, like the young girl who carried her brother on her shoulders a long distance: “No, he's not heavy; he's my brother.”[viii] After all, loving is not optional; it’s mandatory. May our decisiveness and intentionality in this regard enable us to truly inform, form and transform minds, hearts, and cultures; and may we do so united in Christ for a new evangelization from sea to shining sea, from the rising of the sun to its setting. Martha Fernández-Sardina is the founder and director of Prepare The Way Enterprises and Remember You Are Loved™, and an international, bilingual new evangelization speaker, trainer, ministry consultant, and translator touching thousands around the world through talks, radio, TV, articles, and social media. She served the Archdiocese of Denver as Director of Communications for Hispanics, the Archdioceses of Washington and San Antonio as Director for Evangelization, and Evangelization 2000 as Associate Continental Director and Director of the Prayer Campaign. Find, friend and follow her and ask about her talks, CDs, DVDs, articles, and shows at: Facebook.com/iEvangelizeMarthaFernandezSardina, Facebook.com/RememberYouAreLoved, iEvangelize.wordpress.com, @iEvangelize, Vimeo.com/MarthaFernandezSardina, and RememberYouAreLoved.com. [i] See Historic Hispanic Presence in the U.S and my Pastoral Care of Migrants To Do List: iEvangelize.wordpress.com. [iii] Pontifical Council for the Pastoral Care of Immigrants and Itinerant People, Instruction Erga migrantes caritas Christi, 2004, art. 101 (quoting The Church and Human Mobility: Pontifical Commission for the Pastoral Care of Migration and Tourism (May 26, 1978). [iv] Cf. http://www.romereports.com/2016/05/26/the-key-points-for-unveiling-ideol... ; cf. https://www.ncronline.org/news/vatican/francis-warns-against-ideological.... http://www.wsj.com/articles/pope-francis-to-speak-at-united-nations-1443... .
[vi] Cf. Instruction Erga migrantes caritas Christi, arts. 24, 38. [vii] Cf. 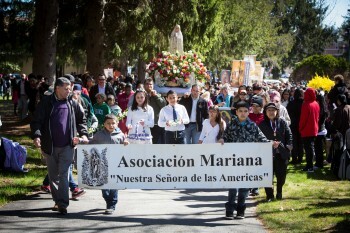 Homily of the Mass of Canonization of Saint Juan Diego, Pope John Paul II: https://w2.vatican.va/content/john-paul-ii/en/homilies/2002/documents/hf... .
Art Credit: "Marian Day Hispanic Community" photo by George Martell, Archdiocese of Boston Flickr.com. This article originally appeared on pages 30-33 of the printed edition.